The religious fanatism of Muhammadu Buhari knows no bound. He is madly in extreme position that he wishes he could lead another Jihad down to other non-Muslim communities of Nigeria. If Buhari regrets anything, it is his non-achievement of this singular plan in his youth. The coming of this religion bigot in 2015 having been heavily funded and delivered by Saudi Arabia, the US under Obama and David Cameron of Britain, has nothing in mind to achieve other than quick Islamisation of the entire Nigeria. In expressing his readiness for this, he infiltrated his cabinet with fundamentalists and strategically position Muslims in all the Armed Forces and service chiefs. Having led the ground ready for official Islamisation of the country, he started the release of Boko Haram prisoners whom he knows will do the Jihad for him and reabsorb them into the Nigerian military. In March 2016, he gathered world Muslim leaders in Abuja for briefing and inspection of how prepared his foot soldiers are. The briefing was done under the pretense of International Islamic Conference held in Abuja. The road map was sketched, and areas of disagreement in plans were reconciled with his international funders. Since then many Christians and other non-Sunni Islamic adherence have been killed and gruesomely murdered. At the supervision of this present Government, their Jihadi-soldiers under the false flag of Herdsmen have wrecked down various Christians communities and many lives lost at the applauds of the present regime. Christian clergymen were asked not to speak or get molested by the DSS and other security operatives. Those of the clergymen who defied this orders were humiliated and treated like animals. Having succeeded in intimidating Christians and the Shiites, the Government is poised to rout out the observance of Jewish Religion in Nigeria. This they are doing by configuring all the security arms and agencies of the government to map out harsh measures in dealing with them. 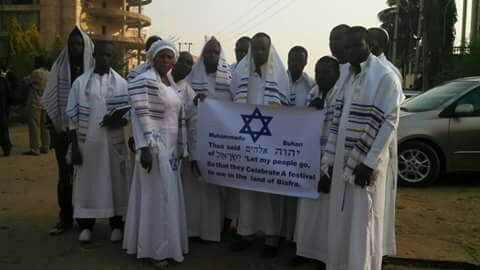 The recent harsh and stringent bail condition melted on Mazi Nnamdi Kanu having heard that he is of the Jewish faith by the Judge is a clear affront and soft approach of clamping down on the Jewish Religion observance in the country. If the experiment is allowed unchecked, the next move will be to marshal out a bloody and draconian approach against the Jewish Religion observance in Nigeria. It will be recalled that Nigeria is a free religion state as enshrined in the 1999 constitution of the federal republic of Nigeria but the attack on other religious faith in Nigeria leaves an unanswered question if Nigeria is really practicing freedom of religion. It is very disheartening that Nigeria prefers to embrace a very violent religion like Islam as opposed to other religions as Christianity and Judaism.